It's VERY easy to use and VERY powerful. Honestly feels like a big leap in productivity tools. Airtable just feels like magic and seems to address many of the weaknesses of other great tools all at once. I have started to use it across all of Operation Fistula's work, but also across my client's work too! Organization: Helps keep the various programs and rentals, along with all contact information, notes, and budgeting requests in line. Task Management: Easy to share documents with both team members and outside contacts, such as board members and volunteers, to assign and keep track of tasks related to the various programs, events, and exhibits we host. Also helps keep track of priority of these tasks. Flexible: Only having used the product for a few weeks, AirTable has proven to be a very flexible platform to use and adapt to our various needs. I am already looking forward to learning about the deeper functionality of the program and how we can adapt it for our use. Smart due dates are the greatest thing about Wunderlist. I can tell it to "print past due reports on Monday" and then set that up as a repeating event. It's clutter free. When I'm creating or assigning tasks I like to have a distraction free area to think, and the simplicity of Wunderlist gives me that. The fact that I can look at it on my phone, on the web, and on my PC and it always looks the same is great. I can always tell what I'm doing b/c of their consistent design choices. Linking across bases: We basically use one big "HQ" base as a pared down CRM where we store all our contacts and their basic info, then link them to separate, more detailed tabs for our Speaker Network, Entrepreneur Network, Funders/Partners, Country Profiles, etc. This is great, but we also use Airtable to manage our application process (startups applying for our quarterly program) and plan the program itself (where it becomes more of a project management tool). Right now, we have to copy and paste our entire Speaker Network tab from the HQ base into the Program Planning base 4x/year, and any update we make to either of these places doesn't reflect in the other. It's super frustrating and creates additional work and lots of confusion. I'm not sure what the technical challenges of allowing users to link bases are, but even if you could just link one "main" tab from a base into other bases that would allow that to be the central nervous point for the whole workspace/team, that would be massively helpful. Honestly? this is the best to-do app I've ever used. I can't think of how to improve the core functionality. Maybe if they added a feature like trello to have "boards" for each project as added functionality for more complicated projects? But I wouldn't want them to replace the current list features for this. Thought of something - integration with time doctor or time tracking software and invoicing software would be amazing to have. It's working, and doing precisely what we selected it for. The only hesitation is if Microsoft suddenly drops the platform. It's usability is perfect. Easy to use and does exactly what we need it to. Only points off are for a somewhat dated looking interface. Haven't needed to contact support for anything and don't want to penalize here with a low number. Piece of cake to install, create and account and get going. SAIC is a gSuite campus and Airtable is a very good companion to the gSuite. The Airtable gDrive integration is quite good and Airtable solves problems that gSuite simply does not solve. 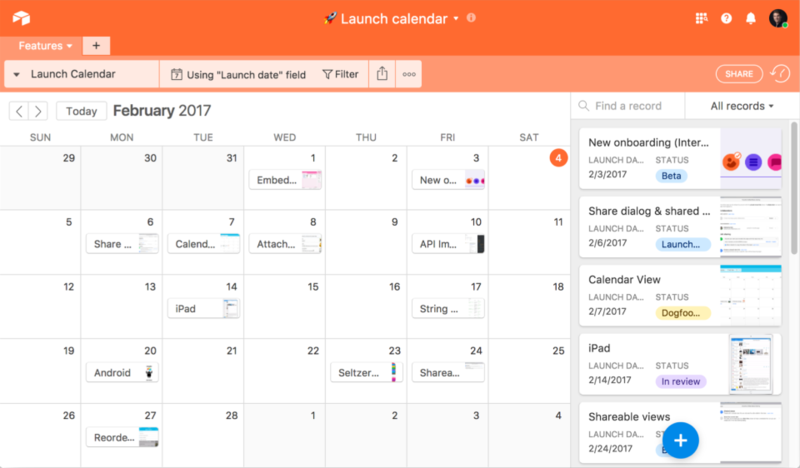 Though it does not replace them, Airtable also plays well with our Project Management toolsets. Trello is great, but it's a bit complicated for my needs. Wunderlist is easy to use and has the features I need without giving me too many options that I wouldn't use on a regular basis. Wunderlist has been instrumental in helping me to organize and manage my tasks. It is also very helpful that it is quick and intuitive to add a new item to a list and continue on with what you were doing without being bogged down by an interface that is non-intuitive.